I like the lyrics to a song Matthew West wrote that say “It’s the hardest thing to give away, and the last thing on your mind today. It always goes to those that don’t deserve. Forgiveness”. That sums it up! Forgiveness is oftentimes misunderstood and standing ready to forgive can be quite painful and uncomfortable. Forgive and forgiveness are extremely important concepts in the Bible yet the King James Version lists the word forgive only 28 times in the Old Testament and 28 times in the New Testament. 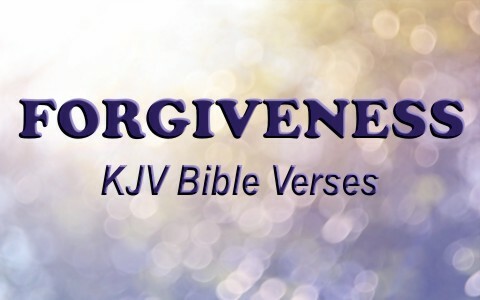 Let’s take a look at some of the awesome KJV Bible verses about forgiveness. Our relationships on earth must include regular opportunities for forgiveness to strengthen our relationship with the Lord. What a great promise written by the psalmist. The Lord stands ready to forgive and the forgiveness and mercy that He gives to ALL that call upon Him is plenteous. No matter what we do, the Lord will always be there to catch us when we fall and forgive our many, many sins (Psalm 37:24, Psalm 118:13). Forgiveness and mercy are some of the attributes of the Lord. The great prophet Isaiah reminds us of what the Lord said about forgiveness. He not only forgives our transgressions (sins) He chooses to remember them no more. In this verse the phrase “blotteth out” is used as a synonym for forgive. Forgiveness requires a great deal of humility. We must be willing to confess that we are in need of forgiveness before God will grant it. However, clearly this passage in Isaiah is a promise that when we forsake our wicked way and walk with the Lord, He will have mercy and grant ABUNDANT pardon. In the Bible oftentimes the word “pardon” is used to mean forgiveness. Another amazing promise, this time from the prophet Jeremiah, echoing what Isaiah wrote earlier. This is a very enlightening portion of Scripture in that Jeremiah is talking of a time when the Lord will make a new covenant with the house of Israel and the house of Judah. He speaks of the day when the law of the Lord will be written in the hearts of men so that they will know Him. He speaks of the time when they will no longer need to teach about the Lord because they will have Him in their heart already. This is a time when God will have already forgiven their sins and chooses to remember them no more. Forgiveness is an everlasting covenant between God and His true believers. Micah 7:18-20 Who is a God like unto thee, that pardoneth iniquity, and passeth by the transgression of the remnant of his heritage? he retaineth not his anger for ever, because he delighteth in mercy. He will turn again, he will have compassion upon us; he will subdue our iniquities; and thou wilt cast all their sins into the depths of the sea. Thou wilt perform the truth to Jacob, and the mercy to Abraham, which thou hast sworn unto our fathers from the days of old. God is longsuffering when it comes to sin because He is merciful. Even though there came a time when God offered salvation to the Gentiles because the Jews rejected it, there remains a remnant that will see Him in glory (Acts 13:14-52, Romans 10 & 11). He promised salvation and He will be faithful to perform it. He is compassionate and His compassion equals forgiveness. Mark 11:25–26 And when ye stand praying, forgive, if ye have ought against any: that your Father also which is in heaven may forgive you your trespasses. But if ye do not forgive, neither will your Father which is in heaven forgive your trespasses. Jesus stresses the importance of a heart that is right with our brothers and sisters when it comes to forgiveness. He goes as far as to say that our unwillingness to forgive when it is necessary will delay and even cause our Heavenly Father to withhold the forgiveness we so desperately need from Him. Our relationships on earth must include regular opportunities for forgiveness to strengthen our relationship with the Lord. Acts 10:42-43 And he commanded us to preach unto the people, and to testify that it is he which was ordained of God to be the Judge of quick and dead. To him give all the prophets witness, that through his name whosoever believeth in him shall receive remission of sins. Chapter 10 in Acts is a pivotal point in which Peter was called by God to preach to the people at Caesarea after appearing to Cornelius. The Lord sent Cornelius to Joppa to find Peter so that Peter could “preach unto the people, and to testify that it is he which was ordained of God to be the Judge of quick and dead.” It was during this discourse that the Holy Ghost was poured out not only on the Jews, but also on the Gentiles. This astonished the Jews and was a sign to them that “remission” or forgiveness of sins was (and is) available to “WHOSOEVER” believeth in Jesus. James 5:15–16 And the prayer of faith shall save the sick, and the Lord shall raise him up; and if he have committed sins, they shall be forgiven him. Confess your faults one to another, and pray one for another, that ye may be healed. The effectual fervent prayer of a righteous man availeth much. This passage in James is often used to speak of faith and healing. However when you look at it in context it really is stressing the importance of admitting fault and praying for one another. Healing is not only needed for sickness, but we must also pray for healing of the heart that is in need of granting or accepting forgiveness. Forgiveness is a multifaceted concept. Many words in the KJV Bible are used as synonyms for forgiveness including, pardon, mercy and compassion. We are admonished to have a forgiving heart toward our brothers and sisters, just as God has for us. We can even count on forgiveness as an everlasting covenant between God and His true believers. does the offender have to ask for forgiveness before we are obligated to forgive them? In all instances..
Hello John. No, the offender does not have to ask for forgiveness before we forgive but we shouldn’t feel “obligated” but compelled because God has forgiven us infinitely more! Did this help you sir? Hello Teresa. It is hard to forgive someone who is still committing adultery. This husband of yours sounds like he doesn’t know Christ and is not saved. Pray for him since only the Holy Spirit can convict him of this sin. Please call your pastor too and tell him what’s going on. Will your husband agree to counseling? If not, go there yourself. Where in the KJV Bible does it say that we have to ask God to forgive us our sins? King James or other Bibles all say the same thing. We are told to confess our sins and God will forgive us of all unrighteousness (1 JOhn 1:9). Mark 11:25 and dozens more say things like “And whenever you stand praying, forgive, if you have anything against anyone, so that your Father also who is in heaven may forgive you your trespasses.” Have you neer asked God to forgive you of your sins? Didn’t you do that when you were saved? If you sin, you don’t think we need to ask God to forgive us? And, if you have sinned against someone, don’t you think it is right to ask them to forgive you? What about your spouse or others? Previous post: Do Colors Have Special Meanings When Used In The Bible? Next post: Do We Have An Appointed Time Of Death? Does God Know When We Will Die?